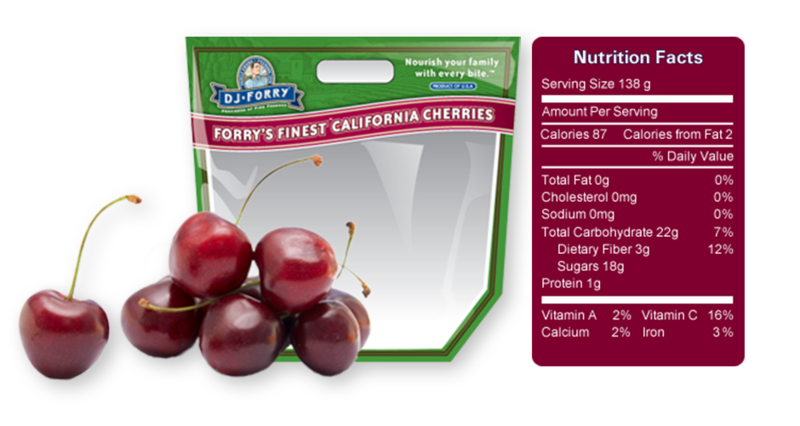 At the DJ Forry Company we work hard to bring the best California Cherries from the San Joaquin and Santa Clara Valleys to you. That’s why DJ Forry works with farming partners that share our passion to offer only the best. Our network of family farmers utilize the latest, most up to date farming and harvesting methods to ensure only the best and safest cherries reach your table. Choosing Quality Cherries is Easy. First, look for our new Forry’s Finest stand up bag. Then, look for plump deep red cherries that feel firm to the touch…avoid those that are wrinkled. Bright green stems are a plus but don’t really indicate freshness. Cherries are loaded with vitamin C and are high in fiber. Cherries also provide nutrients like boron for bone health and quercetin for heart health. Keep your cherries refrigerated when possible. Cherries will last longer when kept chilled. For the best results, we recommend that you store cherries in their original container, and refrain from rinsing until ready to use. Always remember that like grapes, cherries will absorb refrigerator odors, so keep containers closed. Sweet Cherries are packed full of vitamins like vitamin C, and minerals like iron, potassium, and dietary fiber. Plus cherries are low in calories, fat and sodium free. Cherries are known as pigment rich fruits; these pigments are made up of polyphenolic flavonids known as anthocyanin glycosides. Anthocyanins are known to have powerful anti-oxidant properties. Anthocyanins in cherries have been found to act like anti-inflammation agents. Frequent cherry consumption has the potential to provide health benefits against episodes of gout and arthritis. Heart Health: Cherries contain a flavonoid called quercetin which research has found to aid in the prevention of heart disease. Cherries are considered a good source of quercetin. Bone Health: Cherries are an excellent source of Boron. Boron when consumed with calcium and magnesium may increase bone health.